Sossusvlei (sometimes written Sossus Vlei) is a salt and clay pan surrounded by high red dunes, located in the southern part of the Namib Desert, in the Namib-Naukluft National Park of Namibia. 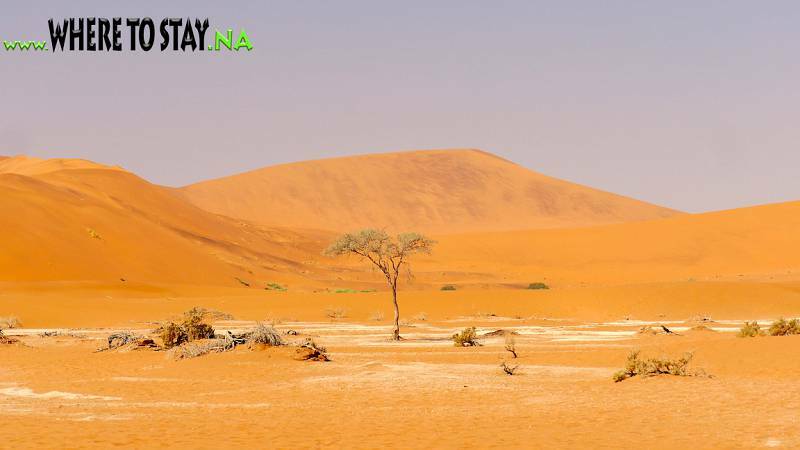 The name "Sossusvlei" is often used in an extended meaning to refer to the surrounding area (including other neighbouring vlei 's such as Deadvlei and other high dunes), which is one of the major visitor attractions of Namibia. 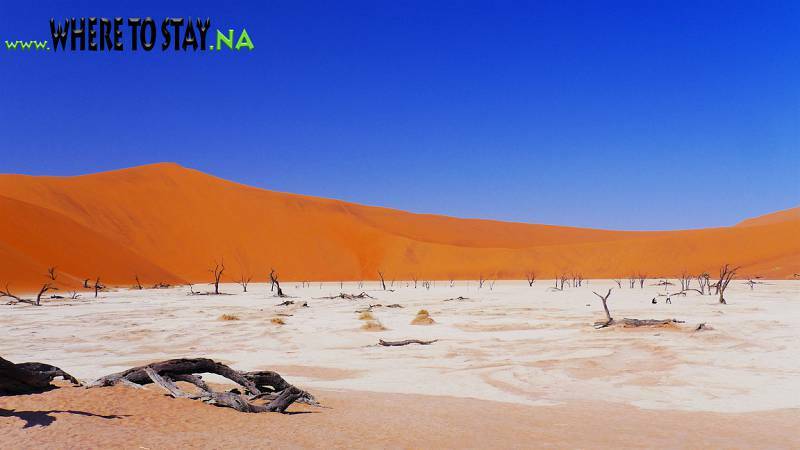 The name "Sossusvlei" is of mixed origin and roughly means "dead-end marsh". Vlei is the Afrikaans word for "marsh", while "sossus" is Nama for "no return" or "dead end". 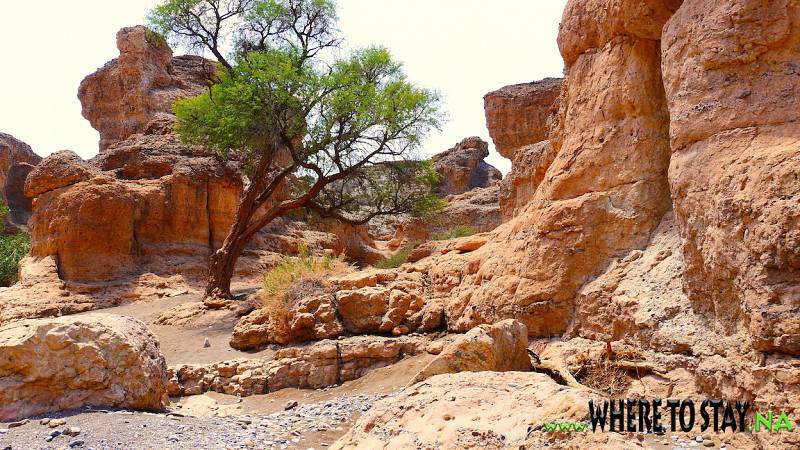 Sossusvlei owes this name to the fact that it is an endorheic drainage basin for the ephemeral Tsauchab River. Main article: Sesriem Access to the Sossusvlei area of the Namib-Naukluft National Park is from the Sesriem gate, which is located in the surroundings of the eponymous canyon. From Sesriem, a 60 km tarmac road leads to Sossusvlei proper. 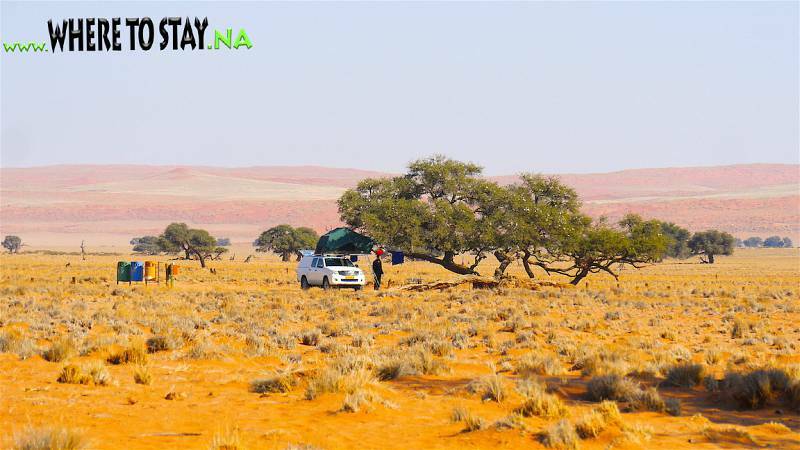 Elim Dune The Elim Dune is a high and relatively isolated dune located 5 km past the Sesriem gate, on a branch of the main road connecting Sesriem to Sossusvlei. The dune takes its name from a farm that used to be in the area before the National Park was established. 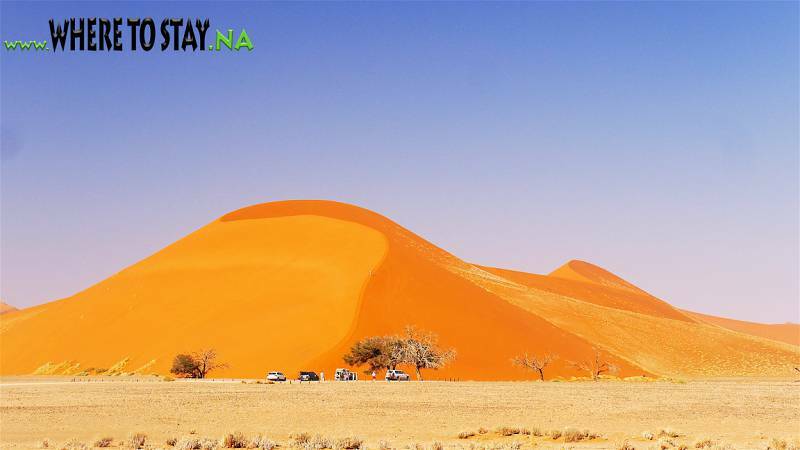 Dune 45 is so called because it lies 45 km past Sesriem on the road to Sossusvlei. 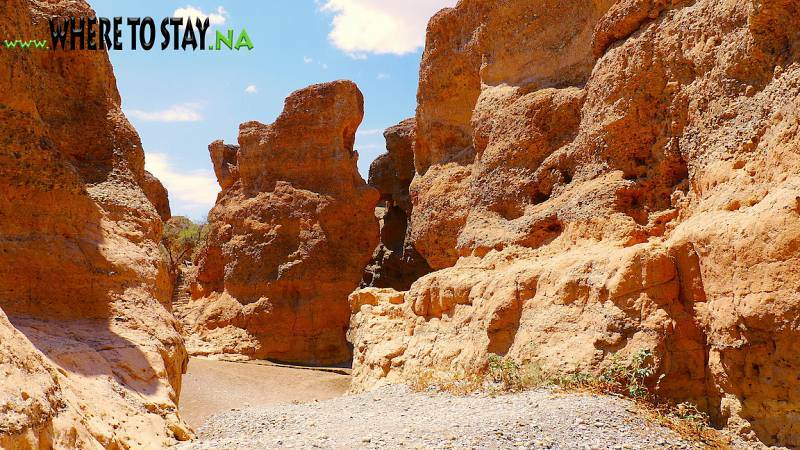 It is 80 meters high and it is composed of 5-million-year-old sands. Sossusvlei is about 66 km past the Sesriem gate. The last 6 km can only be traversed with 4WD vehicles as the metalled road ends and sand begins (the place where the metalled road ends is known as "2x4 parking" as any non-4WD vehicle must stop there). 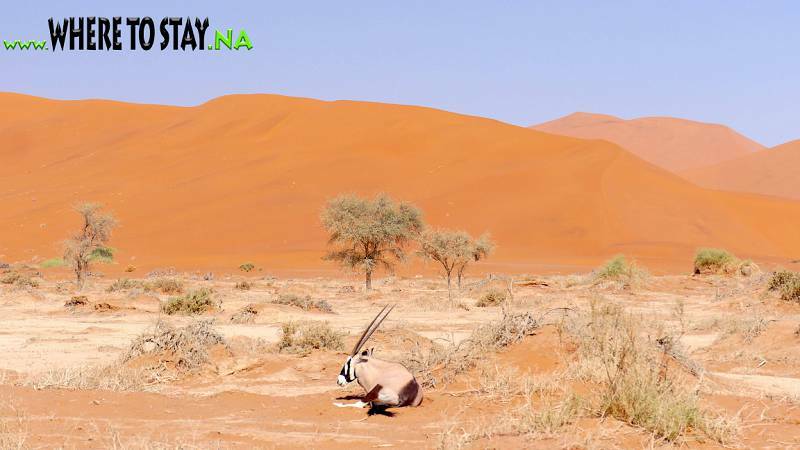 Sossusvlei is a clay pan, of roughly elliptical shape, covered in a crust of salt-rich sand. While the pan has been shaped over time by the Tsauchab river, the actual flooding of the pan is a relatively rare event, and sometimes several years pass between one flood and the next one. The river is dry most of the year, and even when it is not, it carries relatively little water to the vlei. The vlei is surrounded by high orange-reddish dunes, partially covered by a vegetation comprising grass, bushes, and some tree (mostly of species Acacia erioloba). 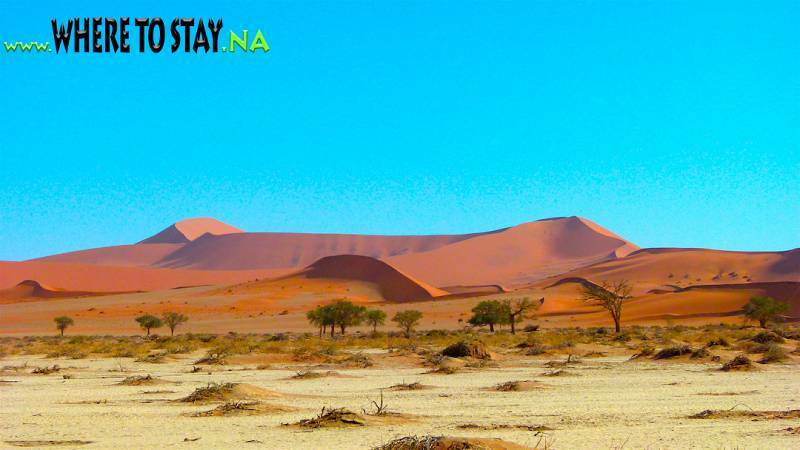 Big Daddy is the highest dune in the Sossusvlei area, at about 325 meters. Dune 7 which is the highest dune in Namibia, not Big Daddy, as it is the seventh dune past the Tsauchab river before dune 45 on the right hand side toward Sossusvlei. Big Daddy is located past Sossusvlei proper, near Deadvlei. It faces another very high dune known as "Big Mama". Big Daddy is distinct from Dune 7 in Namibia, near Walvis Bay. Dead vlei is another clay pan, about 2 km from Sossusvlei. 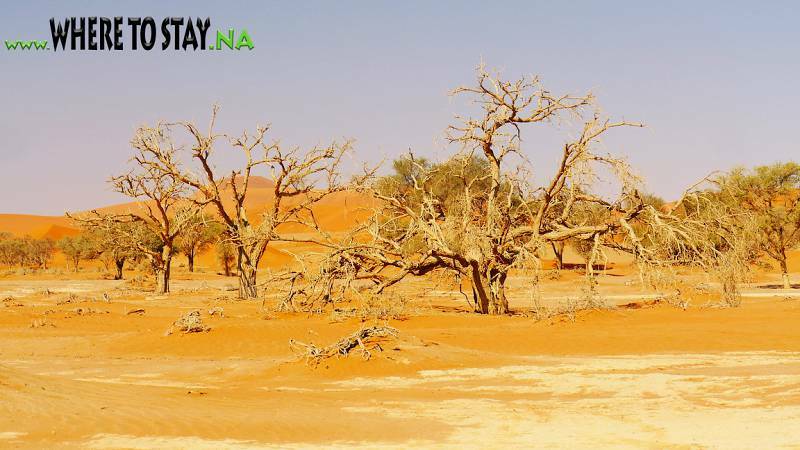 A notable feature of Deadvlei is that it used to be an oasis with several acacia trees; afterwards, the river that watered the oasis changed its course. The pan is thus punctuated by blackened, dead acacia trees, in vivid contrast to the shiny white of the salty floor of the pan and the intense orange of the dunes. This creates a particularly fascinating and surrealistic landscape, that appears in innumerable pictures and has been used as a setting for films and videos. Hidden vlei is the third most famous vlei in the Sossusvlei area. It is 4 km from the 2x4 parking, and it is the least visited. Petrified dunes Petrified dunes are sand dunes that have solidified to rock and are found in several places in the Sossusvlei area.